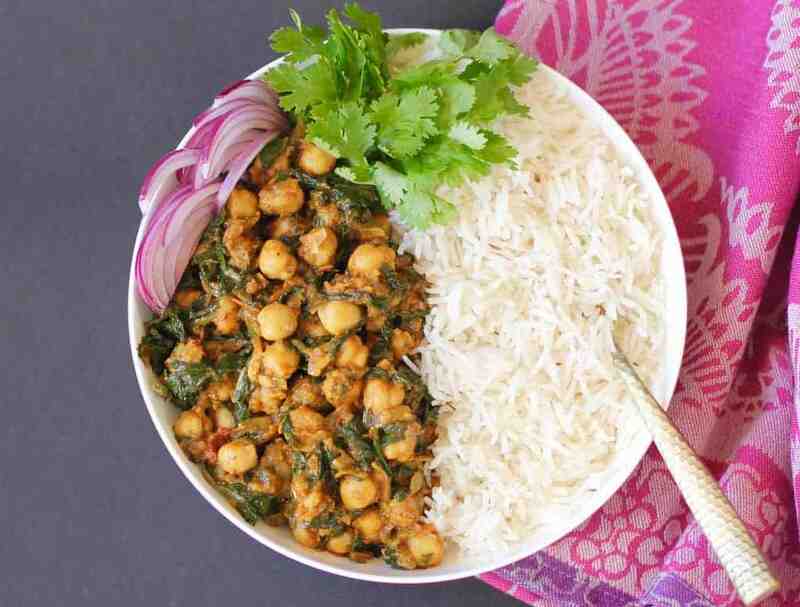 Chana Saag – A vegetarian, chickpea curry with greens cooked in onion, tomato based tangy sauce, spiced with turmeric, cumin and garam masala. 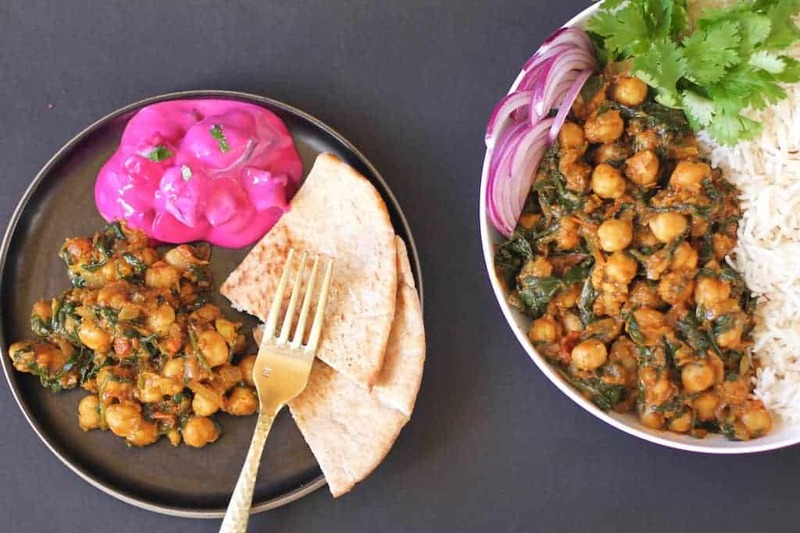 In addition to the restaurant-like Chana Masala, this chana saag dish is a staple for weeknight meals and also a good make-ahead dish for pot lucks and dinner parties. 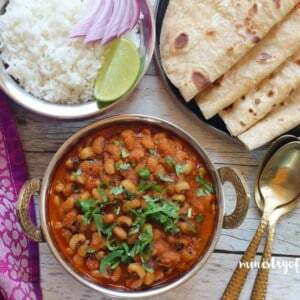 Cooked in under 30 minutes, using few basic ingredients, this Chana Saag is packed with protein, fiber, vitamins and minerals. 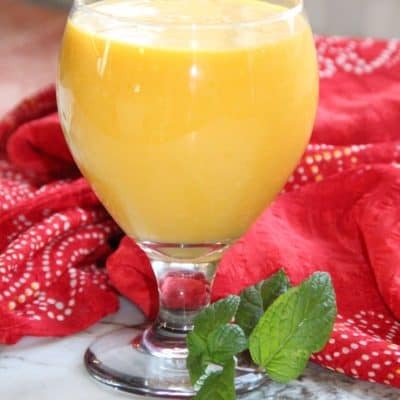 A sprinkle of homemade garam masala gives perfect warmth to this dish and the tangy flavors from dry mango powder rounds up the flavors really well. Since I started cooking in the Instant Pot, I am attempting many of my stove stop dishes in it. I have to agree that there are a few recipes like my Pineapple Sheera, that is so much better cooked stovetop. Then there are many others like the Spinach Daal, Dum Aloo and Palak Paneer that are SO effortless and flavorful in the Instant Pot. It saves time and I do not need to stand around the stove too long. 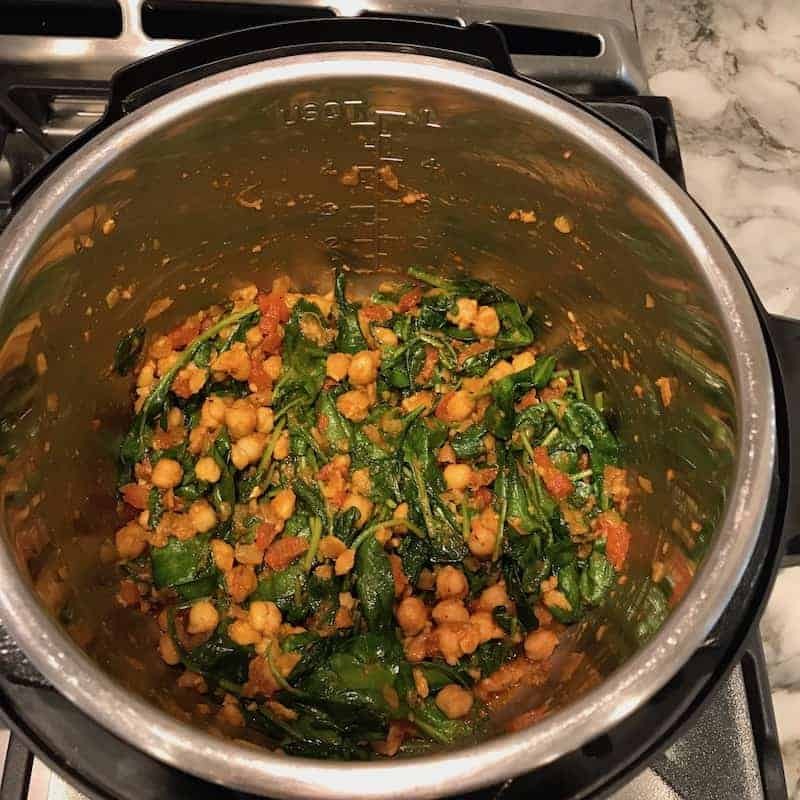 I was thrilled to see how flavorful and easy my stove-top Chana Saag recipe was in the pressure cooker! Saag refers to leafy green vegetables like mustard greens, collard greens and spinach. Since spinach is more readily available, that is my go-to green for this recipe. But you can also use other leafy greens such as mustard greens, beet leaves, swiss chard or kale. Set Instant Pot to Saute mode and add ghee and onions. Cook for 2 minutes or until the onions become translucent. Add ginger, garlic, ground cumin, turmeric, red chili powder and salt. Stir the spices and add tomatoes. Mix well and add the chickpeas. Add 1/3 cup of water and mix well. 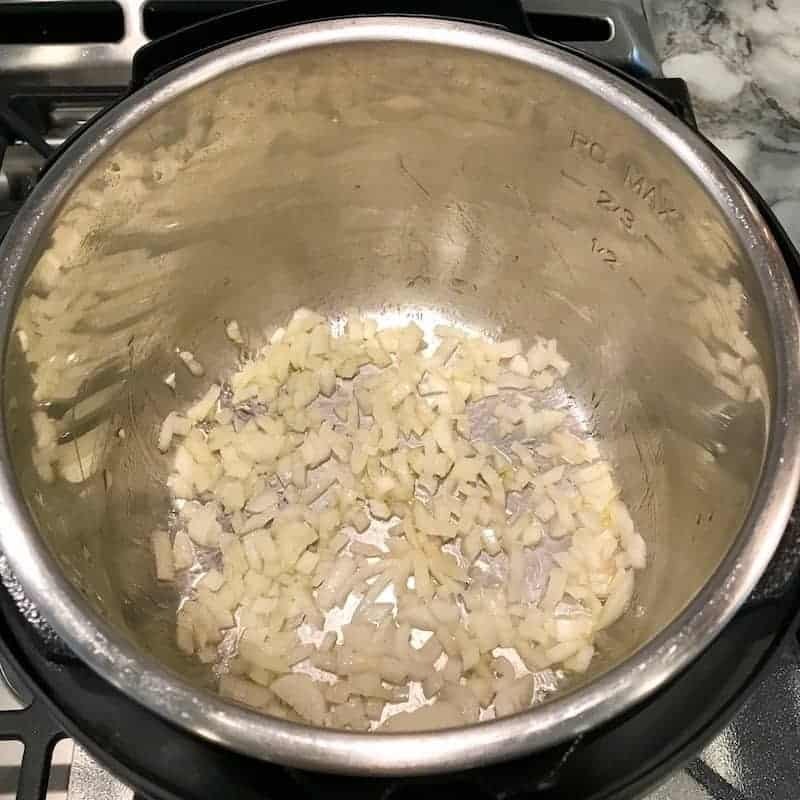 Optional Pot in pot rice directions – To make white basmati rice – Add 1 cup basmati rice, 1.5 cups water and 1 teaspoon salt to a stainless steel pot. You can also add 1/2 teaspoon of cumin seeds and 1 bay leaf. 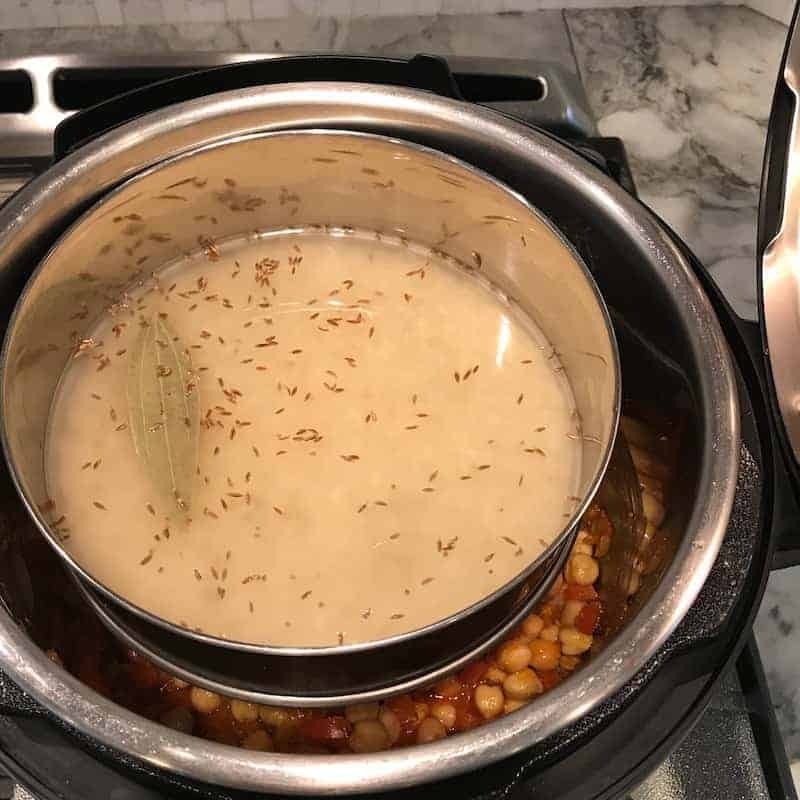 Place a tall trivet in the Instant Pot and place the rice pot over it. Close the Instant Pot lid and pressure cook for 4 minutes followed by 10 minute natural pressure release. Note if you are just cooking chickpeas you can also quick release at this point. Carefully take out the rice pot and the trivet. Add aamchoor powder (or lemond juice) and garam masala. Add spinach and set the Instant Pot to saute mode. Cook for 2 minutes or just until the spinach starts to cook down. 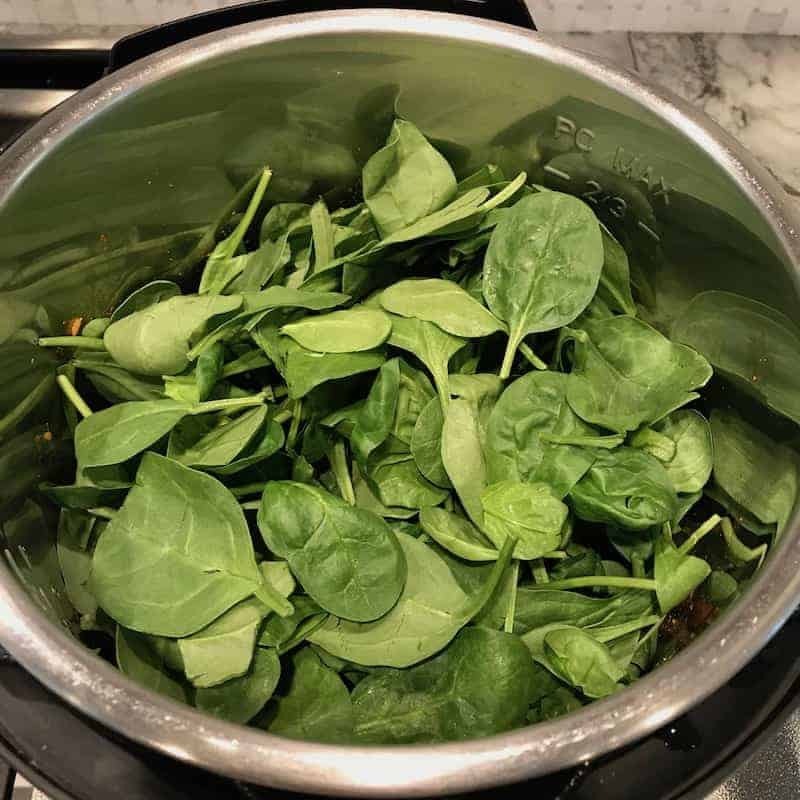 Turn the Instant Pot off to avoid overcooking of the spinach. 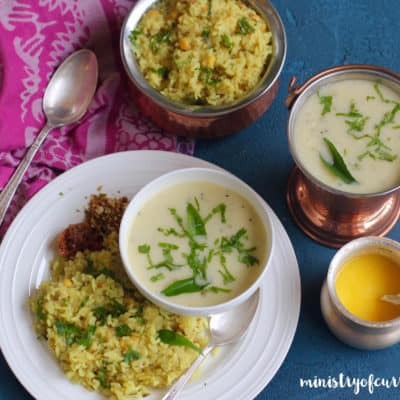 Enjoy hot with steamed rice, naan or parathas! 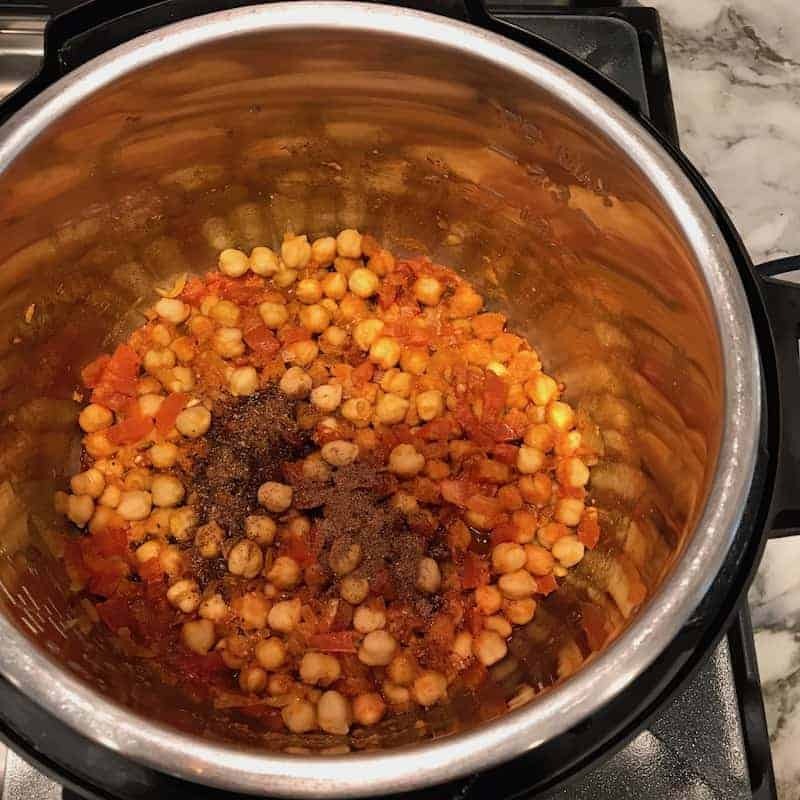 Usually I soak dried chickpeas overnight and cook them for 25 mins in my instant pot. Although canned chickpeas have come in handy many times! 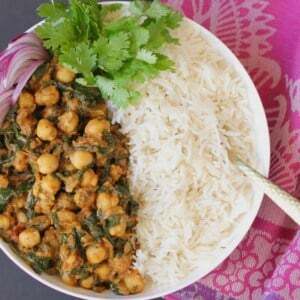 You can make pot in pot white rice along with chana saag when using canned chickpeas. Add 1 cup basmati rice, 1.5 cups of water, 1 teaspoon of salt in a stainless steel pot and place over the tall trivet. 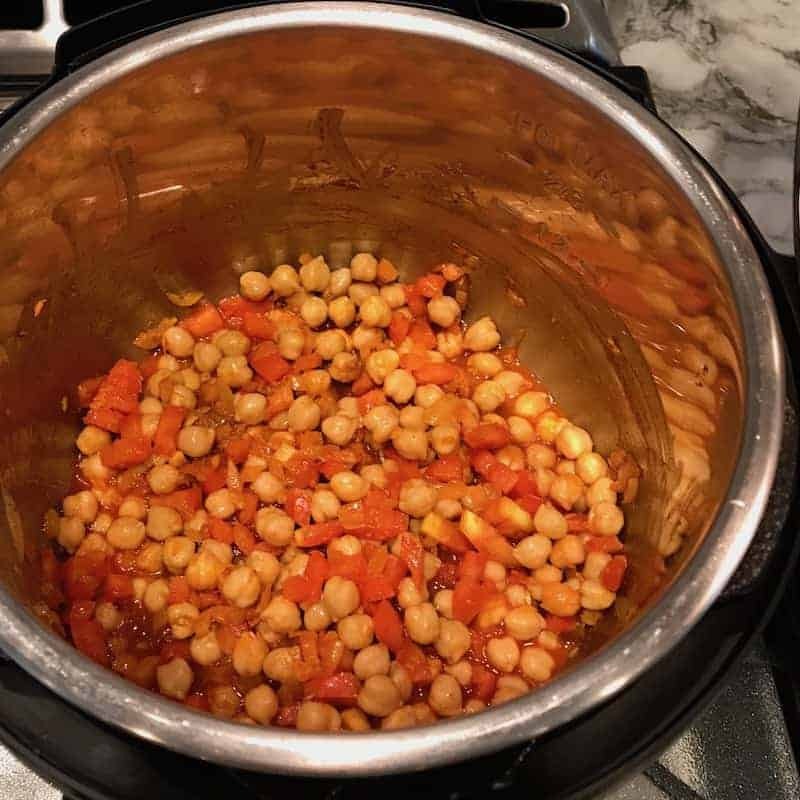 If using pre-soaked chickpeas, add extra 1/2 cup of water and pressure cook for 25 minutes followed by 10 minute natural pressure release. You can also make pot in pot brown rice when using soaked chickpeas as they have similar cook time to brown rice. Add 1 cup brown rice, 1.5 cups of water in a stainless steel pot and place over the tall trivet. To make vegan Chana Saag, simply substitute ghee with oil. 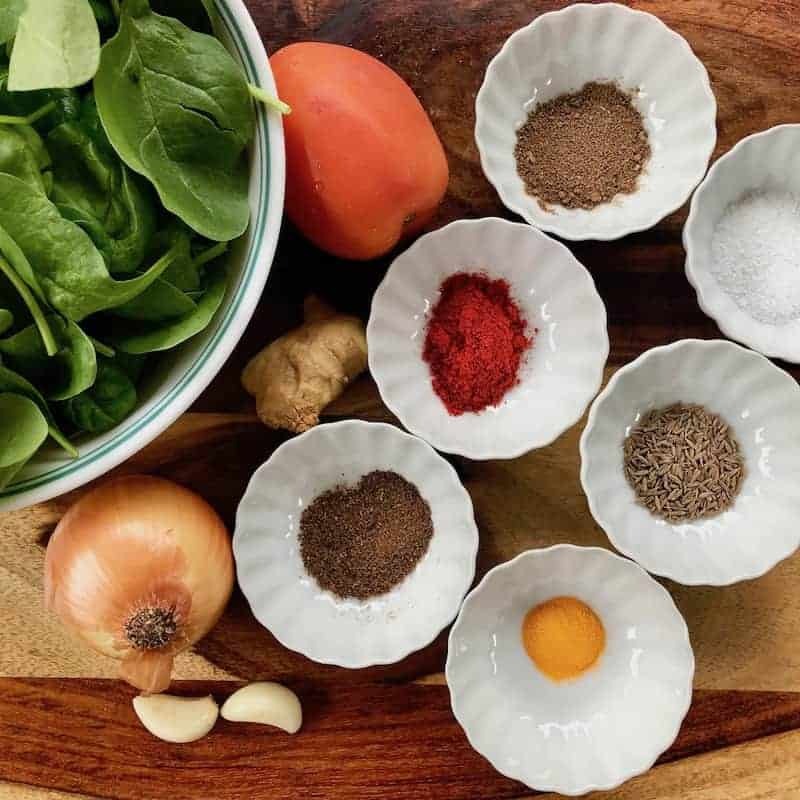 Substitute spinach with your favorite greens like finely chopped kale, swiss chard or beet leaves. A Vegan, chickpeas and spinach dish cooked in onion, tomato based tangy sauce and spiced with turmeric, cumin and garam masala. Turn Instant Pot to saute mode. Once the 'hot' sign displays, add ghee. Add onions and mix well. Cook for 2 mins with a glass lid on. Add ginger, garlic, cumin powder, turmeric, red chili powder and salt. Cook for 30 secs. Add tomatoes and mix everything together. Add 1/3 cup of water and chickpeas. Mix well. Quick release the pressure or if you have time Natural Release is fine too. Open IP lid and set on Saute mode. Add garam masala and dry mango powder. Add Spinach. Mix everything together and cook for 2-3 mins. What if you wanted to add paneer to it? Would you recommend adding it in here (and when) or would you recommend trying to make it in the Instant Pot (if so do you have a recipe)? Thanks! Caroline, I am not sure about chickpeas and paneer together but spinach goes very well with paneer. There is a Palak Paneer recipe on my blog that you might want to take a look at. Also how would this work with dry chickpeas? Just soak overnight and add? Caroline, I actually start with dry chickpeas most of the times. I soak them overnight and the cook time is Manual(Hi) 25 mins instead of Manual(Hi0 5 mins for canned. I do prefer the overnight soaked chickpeas. Have so much freshness to them. Hope this helps. I have also more details in the actual recipe. Let me know if you have any other questions. Let me know how you like this yummy dish! What about amount of water? For soaking use 4 cups of water for 1 cup of chickpeas. Archana-I made this chana saag. Tasty and flavorful. But to answer Caroline-I used dried chick peas that I soaked in warm water for almost 18 hrs. I used the high manual setting for 25 mins. The chick peas were cooked but not soft and tender enough for my liking so I gave it an additional15 minutes of manual high cooking and they came out just as I wanted them to be-intact but soft and easily crushed between fingers. Other than taking so long, the prep is easy and the dish is flavorful. Kalyani, so glad that you enjoyed this dish! I agree that pee soaking in warm water is the way to go! And yes depending on how soft you like them you can definitely increase cook time. The key is to stir in the spinach in the end to keep the bright green color. Thank you again for trying my recipes and your valuable feedback! What is that lovely pink colored side? Yogurt? Doubled the recipe for the four of us + leftovers. 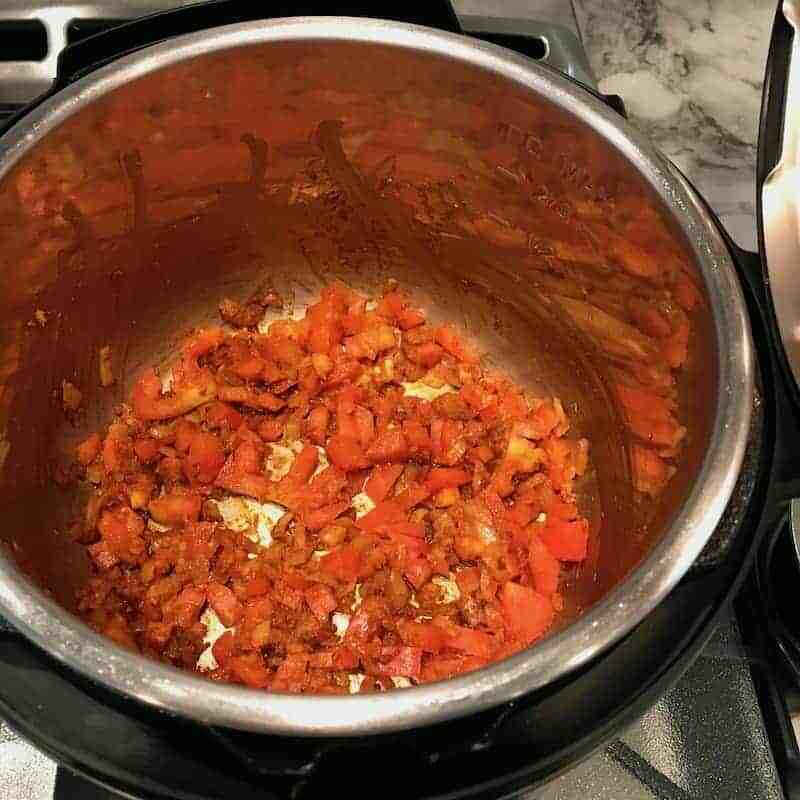 Very tasty – I swapped out 1.5 cups of diced, canned tomatoes & a 12 oz. package of frozen/chopped spinach. My chili powder from Lotte is VERY hot (!) and even though I doubled the recipe, I only added 1 tsp to suit our spice needs. I added more garam masala too because I like the aromatics. Karyn, So glad you enjoyed this. I agree canned tomatoes and chopped frozen spinach comes in very handy! And yes more garam masala is always good. 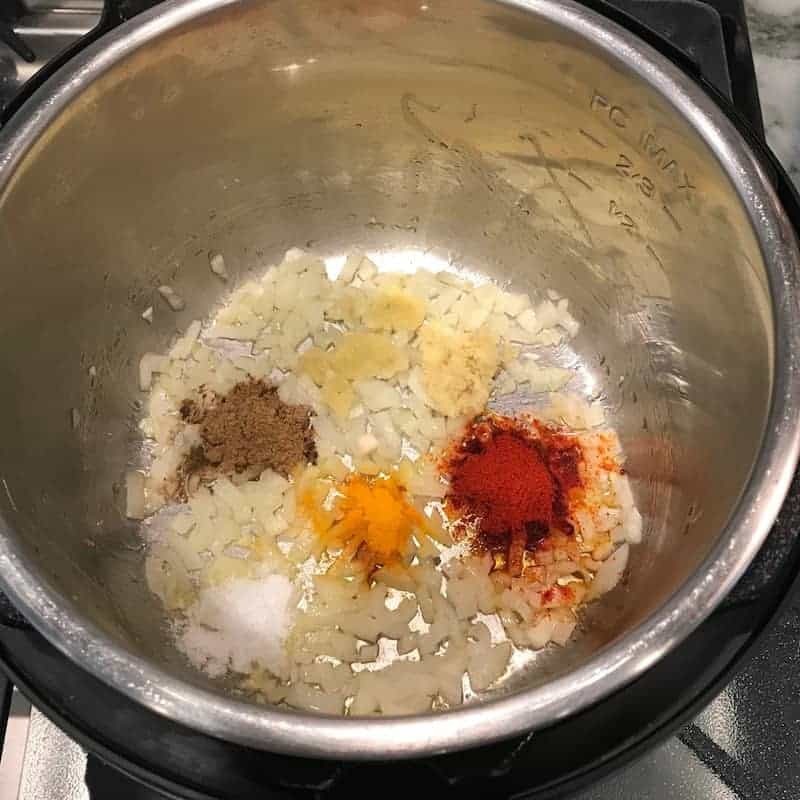 I have few other IP recipes with garam masala that you might enjoy! This looks amazing! What quantity of dried chickpeas do you soak? A full bag (16 oz)? Thanks so much. I have a family of 4, I usually soak a cup of dry chickpeas which after soaking is almost 2-1/2 cups. Also dry chickpeas have a long shelf life. LOVE hummus!! Also double the chana saag recipe. It tastes great the next day! This dish was amazing! I accidentally added the garam masala with the other spices but it didn’t seem to matter. Why is it added at the end? Thanks so much for this wonderful recipe. It is on my favorites list for sure! Thank you for letting me know! So glad you enjoyed this dish. I agree with you that it does not seem to matter when you put garam masala. The only reason I add in the end is to make it more or less spicy and aromatic. Also since I toast my spices for the garam masala, it do not need to be sautéed again with the remaining ingredients. 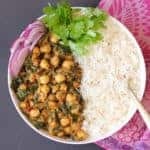 Heather, Chickpea Biryani is another idea for you with your extra soaked chickpeas! Add about 1/3 cup of water. You need just enough for the IP to come to pressure. If there is extra water in the end, just put IP on saute for few mins and it will evaporate. Let me know how it comes out. This is SO GOOD. Used dried chickpeas soaked overnight and the 25 minute mark worked nicely. The 2nd time I made it I used 22 minutes and let the pressure release naturally, also turned out great. Both times I doubled the recipe and the leftovers went quickly. Hi Karl! I am so happy that you enjoyed this recipe. I agree with you on the amounts in cups and cans. In fact I am working on a black eyed pea curry recipe and I have amounts for dry and soaked. I will also fix this recipe so it is easier to follow. Thank you for your valuable inputs and feedback. Do you think you can add Swiss chard instead of spinach ? 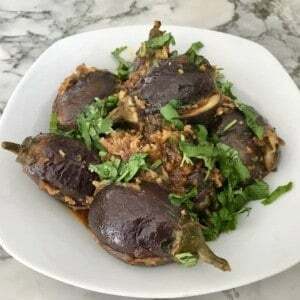 Hi Archana, loved this recipe, as did my family. Looking forward to trying your other Instant Pot recipes as well! Noticed that the salt is missing in the ingredient list, btw. Also, when you use the “Saute” mode here, do you use the Low, the Medium or the High temperature? Would be helpful to add that to the recipe. Thanks! Salt is listed in the ingredients and recipe. And for Indian food it’s usually sauté more – I will add that to the recipe. Thank you for your feedback and I hope you will enjoy other recipes as well. Hi Archana. How much water do we add to the indian pot if we are using the pre-soaked dry chickpeas? Hi Michelle 1 cup soaked chickpeas, 1 to 1.5 cups water works well. I also like them cooked soft so 35 mins works well. In this post you state the need to added 1 to 1.5 cups water along with 1 cup soaked chickpeas but in a previous post (5/17/17 @ 7:19am) you stated 1/3 cup water. I’m very confused. 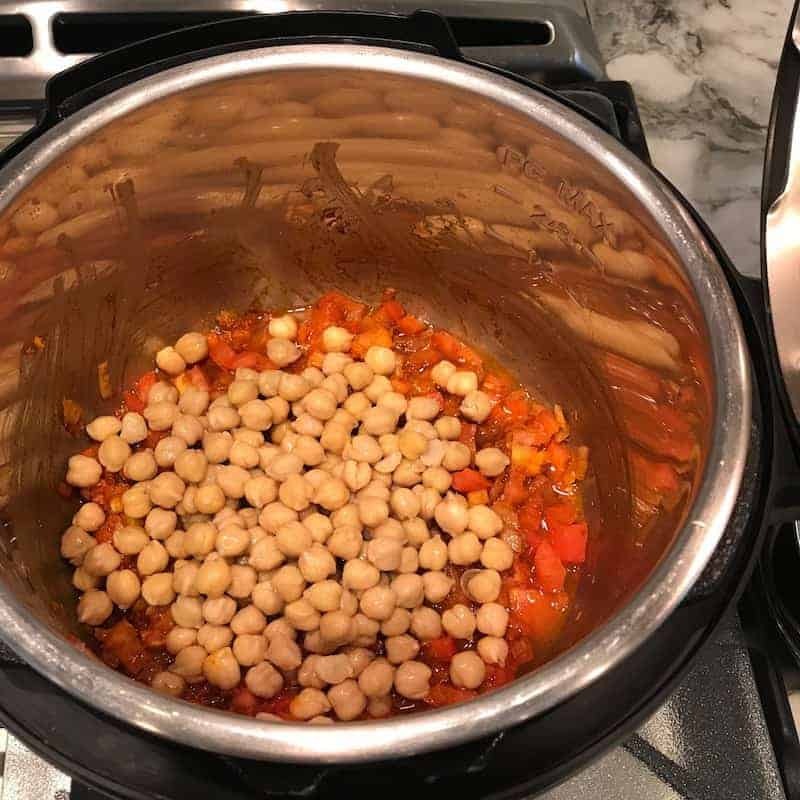 If I follow your recipe to soak a cup of dry chickpeas overnight which should yield about 2 cups pre-soaked beans, how much water should I add to the Instant Pot using this quantity of pre-soaked beans? 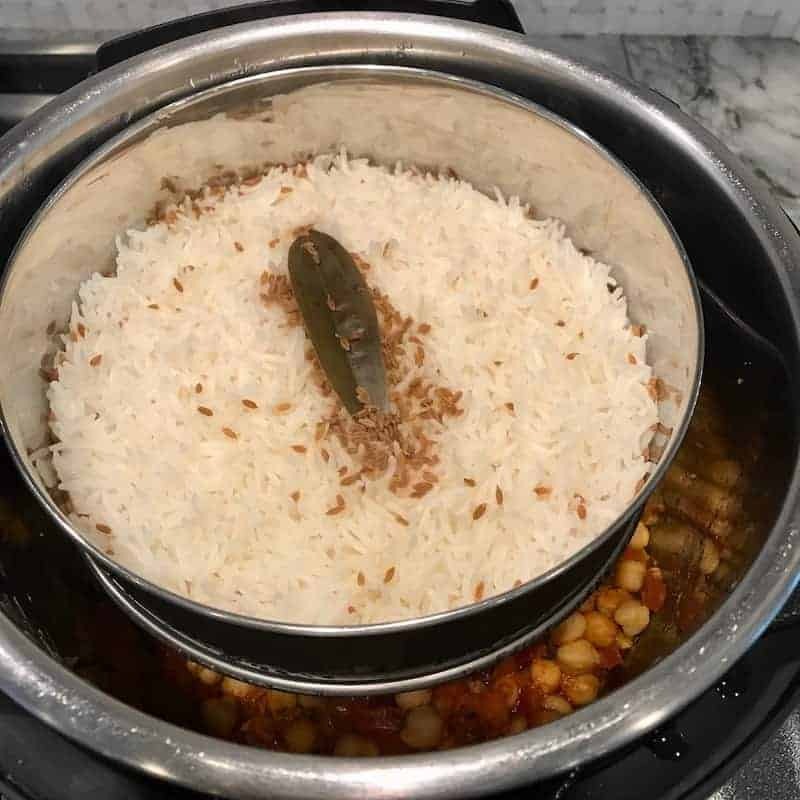 The 1 to 1.5 cups of water is needed for the rice if you are cooking pot in pot rice at the same time as the chickpeas. 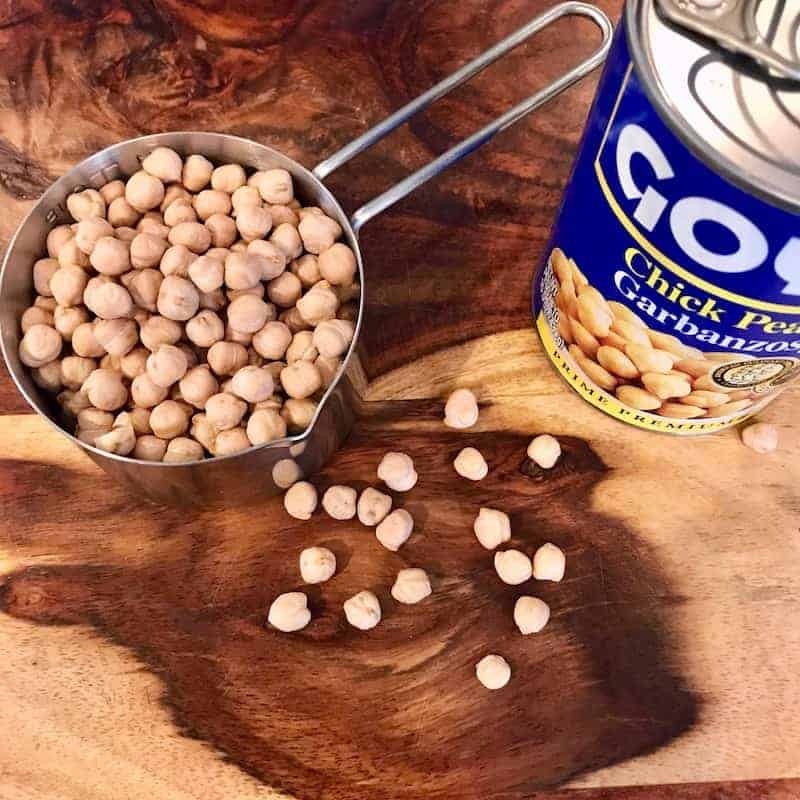 If you just want to cook chickpeas, then you still can follow the same old recipe, with canned chickpeas and use 1/3 cup fo water. Also if you are using soaked chickpeas, you need to add 1/3 cup of water. I doubled the recipe but I made the mistake of doubling the water which made it soupy. I’ll still eat it but for next time I want to try to figure out the right amount of water. How much water do you think would be good for a double recipe…1/2 cup maybe? Or maybe don’t increase the water since there are more tomatoes? What do you think? Few tips – 1. If the curry looks soupy, you can set the Instant Pot to saute mode and cook without the lid for additional 5 mins. Most of the extra liquids will evaporate. 2. Do not double the water as there are double the tomatoes which release a lot of water. Hi: I have an IP but I prefer a stovetop pressure cooker. I’d love if you could give directions for those too! Delicious. My 8 year old daughter ranks it as “a winner”! Thank you! Your feedback makes me so happy!! Thank you for the wonderful recipe! My grocery store sells 5-oz bags of baby spinach. Do you have an idea of how many bags I would need to make 4-6C of chopped spinach?